Paper maché wears a variety of faces depending on whose hands have done the creating. Yamarilet Pacheco of Etsy shop etco shapes vessels that are obviously handmade, yet beautifully refined - not an easy look to achieve. Born and raised in Venezuela, Yamarilet lives in New Orleans. She began working with paper maché a few years ago, and soon became passionate about the technique. 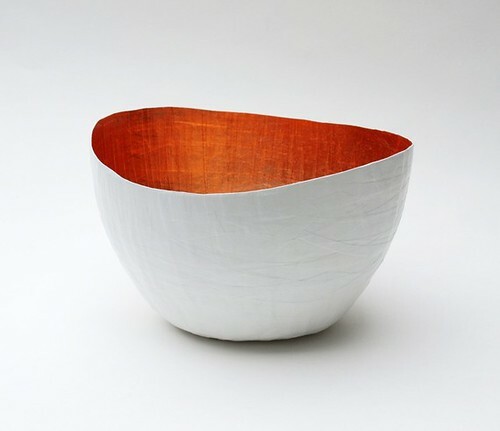 Her process requires the layering of thin strips of recycled paper to give the bowls a lightly textured surface; each one takes many hours to complete. Always the fan of a metallic glow, I like the way Yamarilet brings elegant sophistication to her designs by hand leafing the interiors with copper, silver, or gold. She's also a talented jewelry designer. As always, thanks for all of the insightful comments this past week. Enjoy the weekend! Love your blog ... thanks so much for linking to the book folding! very beautiful and such amazing works in her shop, I did not think that paper mache can be worked to make such delicate objects. Would love to own the scissor mouse. Beautiful blog Ann, thank you so much for featuring my work! How stunning! I love the metallic bronze interior. Wow! I would never have guessed they were paper - such smooth lines!